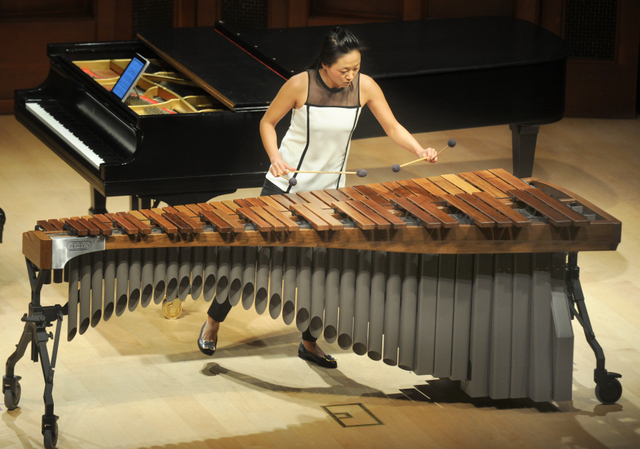 Principal percussionist and marimba master Ji Hye Jung has delighted Camerata Pacifica audiences with her bi-annual appearances for several years. She has struck, rung, and scraped a number of objects, but none so much as the mellow marimba. Her adept four-mallet technique makes her a go-to artist for composers like John Serry, Huang Ruo, and Bright Sheng. Audience regulars this season have been fortunate to enjoy Jung’s artistry twice in six months: September’s season opener, and this Valentine’s evening, where Jung was the Alpha and Omega for a program of solos and duets that also included artistic director and flutist Adrian Spence and pianist Adam Neiman. While ostensible references to the holiday were absent from the program, romance nevertheless prevailed with the positioning of iconic Chopin piano works in the center — heart, rather. The evening began with Jung’s take on the Violin Sonata No. 1 in G minor by J.S. Bach. Percussive translations of this masterpiece have been in the stars lately — CAMA guest mandolinist Chris Thile happened to pluck his own version three nights earlier. Jung swapped hard and soft mallets to color each movement in this fine performance. Bach was a perfect gateway drug to Bohuslav Martinů’s Sonata for Flute and Piano, which is reminiscent of Poulenc in attitude and imagination. Adam Neiman’s beautiful rendering of four works by Chopin, including the irresistible Waltz No.7 in C-Sharp minor, No.2, was the creamy nougat in the evening’s chocolate. The program ended with works by contemporary New Zealand composers Gareth Farr and John Psathas. Farr’s Kembang Suling for flute and marimba is a convincing study in three Asian musical languages: Balinese Gamelan, Japanese Shakuhachi, and Indian raga. Each movement was a tight poem, utterly transporting. Psathas’s One Study, the concert’s other solo bookend, showcased Jung racing the rosewood highway against an electronic music and drum-machine track.